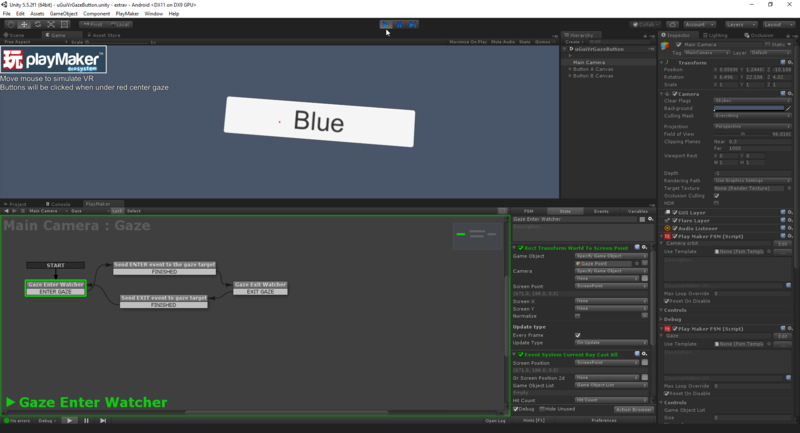 This is a screenshot with the game view. The red dot is vissible, I look at the button, but nothing happens. I don't get any more errors. 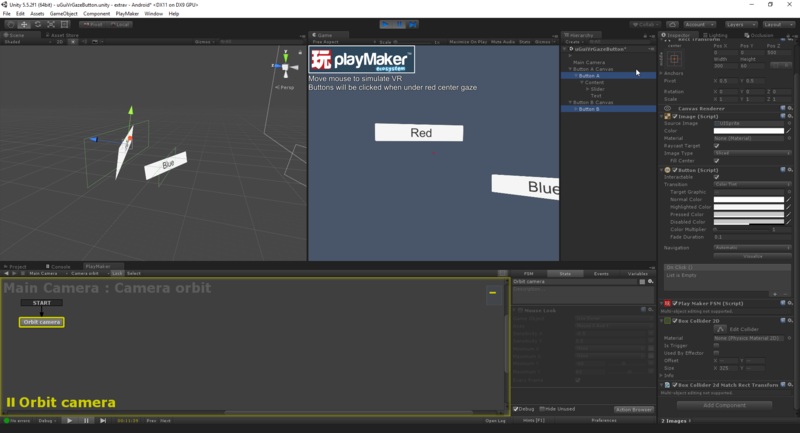 I updated the Gaze thingie, but it only downloads the files I am missing, so I deleted the RectTransformWorldToScreenPoint.cs which had the error 2 days ago... I updated... so this new .cs file got downloaded. No more errors. But I'm thinking that maybe 2 days ago you modified other files that havnt' been updated on my PC. Anyway, I deleted the majority of Gaze files. Did a reimport ... same thing. apart from this missing file, all seems ok. Something is very wrong here. which version of the Oculus do you have? I have the consumer version of Oculus. I just tested this at home. Same project... but no occulus. It works fine!!! 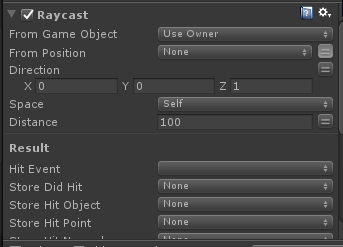 Is there a way to debug the raycast? I'm curious to see how it's being drawn. yeah, odd. So it's either the Canvas and graphic raycaster that is not setup properly to work with the oculus, or the wway the oculus control the camera makes raycasting faulty somewhere along the line, at least with the technic used. Where it seems we can't use any default camera orientation for some reason. can you try this component and follow the instructions? it that works, then great. 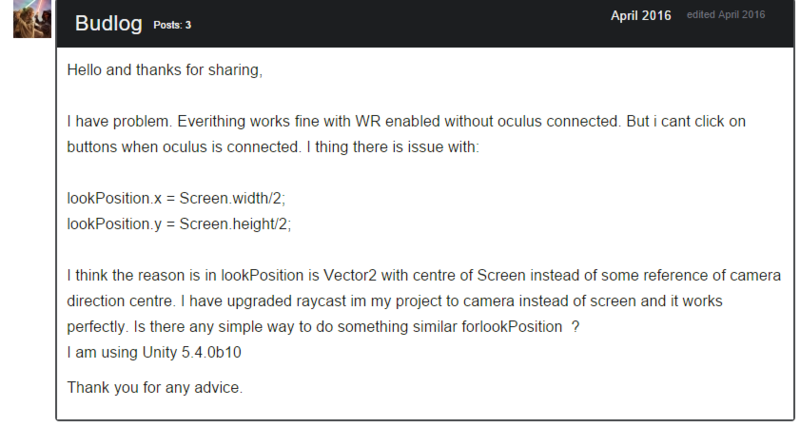 That's a pretty old post from the Oculus forums. 2014. Btw. 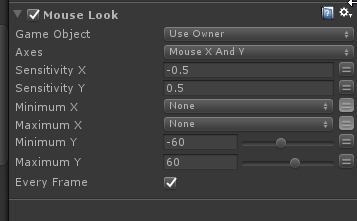 I had a project last year where I used OnMouseOver action. SOmething like that. The cursor was always in the middle hidden, so it made sense to use it. No Raycast used. However in VR this didn't worked because the Oculus Camera overwites the movement. Meaning... even that I move left/right/up/down with my head, the cursor still remained in the "center of a screen". I would nonetheless give it a go. I haven't found anything better on paper when googling for this. 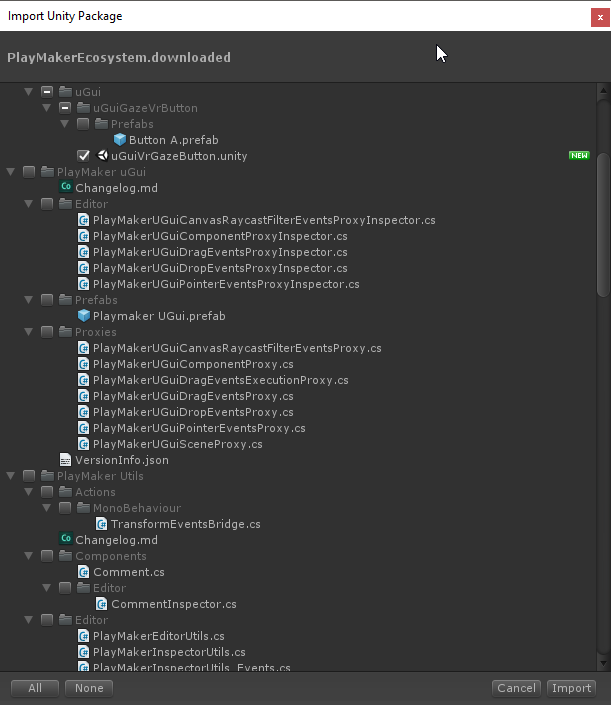 I will look into that project... but from what I see... it's for Unity 4. So the raycast can be casted correctly. Can't we just use a normal raycast and check when we hit the UI buttons? The UI buttons are in world space anyway and they can have a colider. The whole thing is not 100% precise... like I have to look a little bit down in order to trigger the button. Well I don't have to use a Raycast. The problem was the Mouse Look from the Camera orbit FSM. If I disable this, I can Gaze the UI buttons using Oculus! Ofc, as you said, it's a bit offset, but I will use your new small script. Am I not adding the Box Collider 2d Match Rect Transform correctly? I have added it to the Button A & B which contains the Image (Script). It does add that collier ... however the colider is not rotated corectly ... the camera raycast is still a little bit offset. Not a huge deal... I can still use this... I'm just curious on how to do this correctly. I'll do a 3d physics version of this component, that should fix it. Please ping me early next week if I haven't done it yet. did a small test with that scene on GearVR. button work but the problem is that small dot. 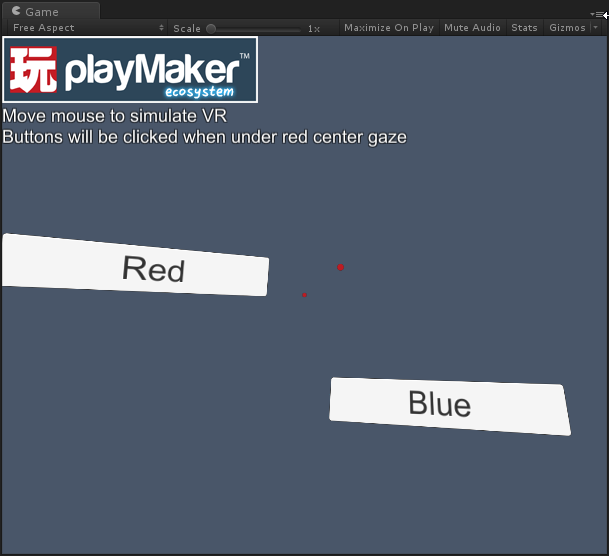 in editor the red dot works but in gearvr it doesn't show up. it was the same in my oculus PC build test. Ok. I fixed the RED DOT problem... by making another Canvas that was set up to Screen Space - Camera! I still find this whole process a bit MEH. 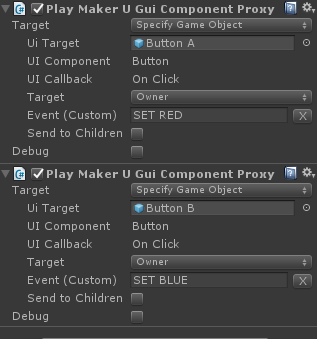 Then you need the buttons logic, then the gaze logic, etc. Well I understand part of the logic... I just don't understand why we also need to have the above 2 scripts.